During the winter of 2012, my good friend asked me whether I could not help his uncle out whom got a big problem with a rogue hippo that was destroying his green corn. The farm is in the Alma area of Limpopo and they wanted me to shoot the hippo whom is terrorizing all and sunder. It had also occupied one of the dams on the farm. Well, he is my best friend after all and with such a plea for help, how could I refuse? First,I did a lot of research on the Hippo as it is a very dangerous animal. 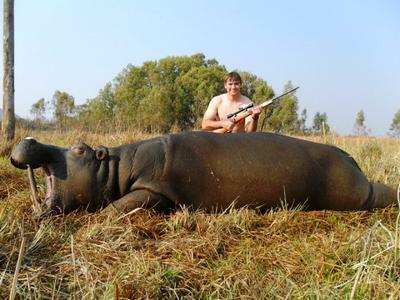 Some of Southern Africa's professional hunter's associations have added the Hippopotamus to their list of dangerous game, and rightfully so! It annually killed more people in Africa than all of the members of the big 5 combined! After reading what the PHASA people said about hunting the Hippo, I knew that I've got my work cut out for me, and that I must be extremely careful and cautious. Well, there you have it. I felt very excited, but also very humble that I've got this opportunity as a young hunter so early in my hunting career. When I started with my own preparations, I reflected on these wise words of the P.H. 's and could suddenly fully understand my old forefathers, the Boers, whom I still idolize motto of 'God and the Mauser', when they went out to hunt in the uninhabited wilds of Africa, most of the time alone and very far from home or any human being for weeks or months! After discussing the hunt with my dad and grandfather, I took one of my best friends, Jandre Tappa with me on the hunt and we left Nylstroom before 10:00am in the morning. We traveled on the Heuningfontein road with only a borrowed .308 rifle and 4 bullets. When we arrived on the farm, just over an hour later, we immediately went to the homestead to greet the owner and to inform him that we will be at the dam trying to hunt the Hippo. When we approached the dam I saw a lot of 'Bloekom'/Blue gum Eucalyptus trees, and then the excitement really kicked in. I again realized how fortunate I was, because where else on earth could you hunt a Hippo for free, and so near to home as well! My friend that has organized the hunt, went with us to the dam. I was relieved, when I saw the water through the trees, that it was not a very big dam. We cautiously and nervously! stalked through a dense reed area around the dam to where the Hippo had exited the dam. The reeds were very dense and high and all we could see, 3-4 meters in front of us, were more dense reeds. Suddenly we heard a big noise of an animal running through the reeds very close to our left. My friend Tappa immediately jumped behind me, as I've got the only rifle. My first thought was that it's a bush pig. When it burst through the reeds very near to us, we saw that it was a very big bushbuck ram! Very quietly we turned to look at Tappa behind us, and he showed us his hands and knees still shivering, as he thought that it was the Hippo charging us through the reeds! Carefully and slowly we continued stalking through the reeds. Have you ever noticed how hot it can be in dense reeds and papyrus? After another couple of meters, as we neared the edge of the reed bed, my friend stopped us and pointed a bit to our right. 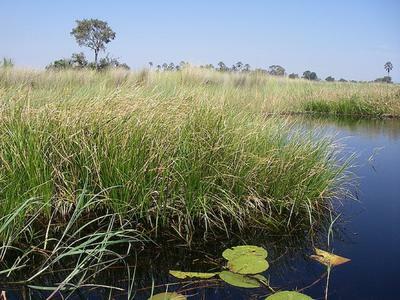 We could vaguely see the outline of the Hippo through the reeds, about 8m (±8 yards) from us! We were uncertain and could not determine in which direction he was facing, and assumed it was to our right, towards the water. Suddenly the wind changed and the hippo jumped up and charged into the water. He was all the while facing in our direction and it could even possibly saw us, in front of his nose, in the reeds! 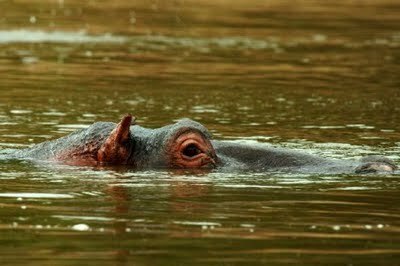 After about 5 minutes the hippo's head appeared above the water about 50-60m away. Just a small piece of its head were visible above the water, and I didn't have a shot. the shot. I took aim at the very small visible target just in front of the ear and squeezed the trigger, but to my amazement a fountain of water erupted behind the hippo. I've missed and shot over its head! He disappeared under the water and resurfaced about 110 m further on in the dam. I was feeling totally miserable at this stage when I realized that I've missed my second shot as well! We stalked to near the place where he had disappeared under the water and waited in concealment. Suddenly he submerged about 60 m away and we could see that he was oblivious of our presence camouflaged between the shrubs and tall grasses on the bank of the dam. This time I held my aim lower just in front of the ear, and when my 3rd shot rang out we could distinctly hear that it was a good shot. With a huge splash he bounced out of the water and to the one side and then disappeared under the water. Again we went back to the truck to wait. After a full hour and 25 minutes we saw him breaking the surface floating. We called the land owner to come with his tractor to pull the hippo out of the water and then we called two other friends who wanted the meat. But now another scary moment awaits me. I had to swim to the floating hippo and fasten a rope around his leg so that the tractor can pull him out. I was not very keen on this, but my friend who was on hippo hunts before convinced me that this hippo DEFINATELY was dead. Reluctantly I stripped and went into the water. When I felt the grass and other submerged material clinging to my body under the water, I told myself that there is not a chance at all that I could outswim this hippo if he proofed to be still alive! I can tell you without a doubt, that swimming towards that floating carcass that becomes bigger and bigger as I came nearer, will be amongst the scariest moments that I've ever experienced in my life! About 5 m from the hippo we stopped swimming and my friend threw some mud at the carcass. I asked him what the meaning of this mud throwing is as we are by that time nearly next to the hippo in the water. He just smiled at me and told me that he declared the hippo officially dead. I told him that I would only believe him if he swam forward in the water and touched the hippo first! After a couple of moment's hesitation, as we were both very scared at that moment and in that situation so close to the floating hippo, he swam the small distance to the hippo touching it and then proceeded to climb on top of it. I then also swam forward and fasten the rope around its one leg. Once the tractor had pulled it outside of the water we could really closely examined it for the first time. Let me tell you, it was huge! Just imagine the brave people of old hunting this beast with only a spear! When I looked into its mouth and saw the size of its teeth, I shivered again as I thought back of swimming towards it in murky water with all types of things touching my body under the water! We took some photographs of the hippo and bravely joked with each other around the carcass. We started the huge task of butchering this hippo bull. First we fastened the rope to a sturdy nearby tree and then struggled to turn it on its back. I would guess the skin was at least 10cm thick and we had to sharpen our knives ever so often. A hippo has beautiful red meat, not unlike that of a domestic cow. The most surprising aspect of the meat to me however was its distinct pleasant smell not unlike milk! We worked at skinning and butchering the huge carcass for a couple of hours, and it was well after dark before we were done. We packed all the meat into a trailer to transport it back to 'civilization'. I couldn't help but to think of my fore fathers, and how they hunted Hippo and the huge risks to life and limb that they had to take on a hippo hunt. I was very happy and thankful for this opportunity to hunt a Hippo so early in my life and hunting career and that everything worked out perfectly in the end! Comments for Youngsters hippo hunt adventure ! A super read!! Great adventure! Thanks for sharing!